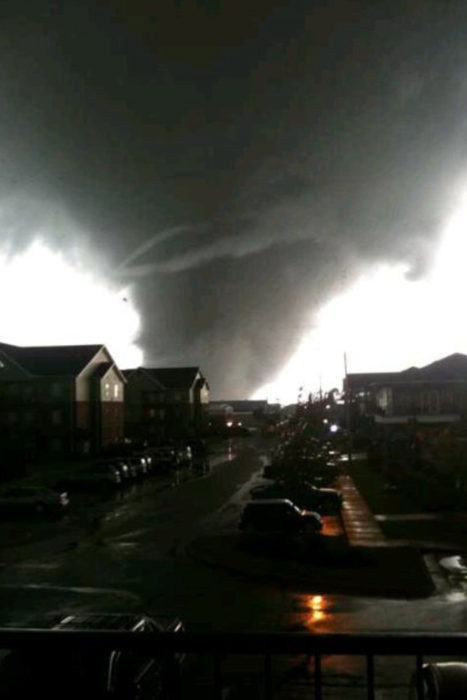 April 27, 2011, became the deadliest day of the biggest tornado out- break in the history of recorded weather. It was the climax of a super- storm that unleashed terror upon twenty-one states—from Texas to New York—in three days, seven hours, and eighteen minutes. Entire communities were flattened, whole neighborhoods erased, in seconds, by the wind. This was an epic storm in an epic month: April 2011 saw three separate outbreaks and a record 757 tornadoes—nearly half of which (349) occurred during the April 24–27 outbreak that inspired this book. This anomalously stormy month blew away the previous April record of 267 tornadoes in April 1974 (and the record for any month, topping the May 2004 count of 542). The storm left in its wake long scars across the landscape, $11 billion in damage, and at least 324 people dead. Most of them died in Alabama, which now leads the nation in tornado deaths. On April 27, a total of 62 tornadoes raked the state; in some moments, there were six or more on the ground at once. This book is based on more than a year of meticulous research and forensic reporting to recreate cinematic scenes with gripping detail. All dialogue, facts, scenes, and details were reported from verifiable sources and interviews. Sources included videos that provided verbatim dialogue and eye-witness visuals of the storm; time-stamped social media posts that revealed the thoughts and actions of characters at specific moments in time; and time-stamped text messages recovered from victims' phones and shared by their families. I transcribed all of James Spann's wall-to-wall TV coverage on ABC 33/40, and used that to create a master timeline of the storm. Spann's live coverage (which also aired on the radio) could be heard in the background of many videos, which revealed the precise time those scenes occurred. Hours of emergency radio transmissions, also time-stamped, provided an accurate minute-by-minute timeline of the immediate response. All dialogue in quotation marks was transcribed directly from an audio or video recording, or was recounted to me in an interview with someone present at the time the conversations took place. Recollected dialogue is not as accurate as transcribed recordings. However, in the cases where it was used, the sources were very consistent in their recollection. When possible, more than one source was asked to recall the conversation. This event is so large and complex that it seems almost unfathomable. This National Weather Service summary page on the outbreak helped me start to wrap my head around it. 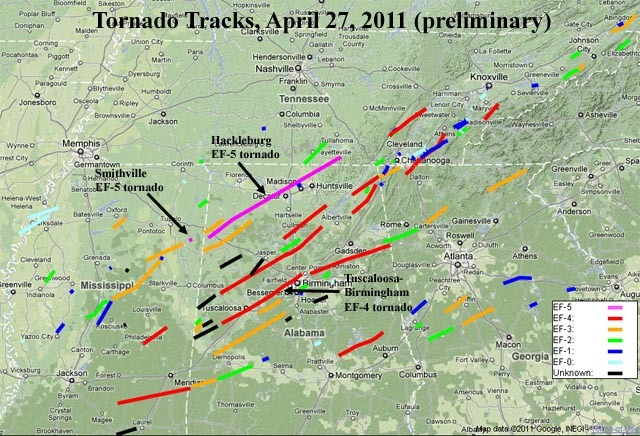 The map shows the location, path, and magnitude of the 62 tornadoes that struck Alabama on April 27, and the numbers on each track indicate the order in which they occurred. Click on a number and you'll see more details. It's worth noting, for perspective, that this shows the tornadoes that occurred in just one of the 21 states affected during the 3-day outbreak. Timelines were essential. I used the NWS data to create an interactive timeline on Timeglider.com (below) that shows the three distinct rounds of tornadoes that happened that day, and indicates which tornadoes were on the ground at any point in time. The Timeglider app also allowed me to indicate the strength of the storm (wider bars = higher EF rating). NOTE: Unfortunately, the Timeglider app has a bug, and the times listed on the bottom of the timeline below are way off. The times I see on my creator end are correct. Apologies—I have sent numerous requests to the company to address the bug. I created other timelines from other sources. I transcribed James Spann's TV coverage from 2 p.m. to 8:30 p.m., which created a 34-page, 12,000-word document with time stamps. (You too can watch it on YouTube, in 15-minute increments!) 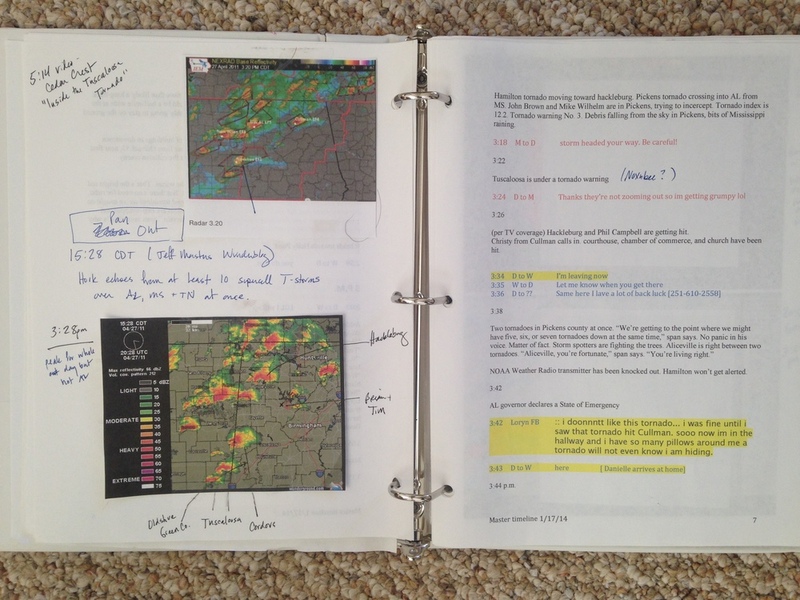 Then there was a meteorology timeline (36 pages, 16,000 words) that combined notes from various NOAA and NWS sources into one cohesive play-by-play of the outbreak. The Most Painful Transcription Award goes to the responder timeline (16 pages, 3,500 words), in which I transcribed the emergency responder radio transmissions on several channels from 4:54 p.m. to 11:45 p.m. Many were garbled and fuzzy and had to be listened to over and over to make out the words. Narrative nonfiction reads like a novel, with characters you care about and suspense that pulls you through the pages. It is meant to immerse you in the chaos, fear, and uncertainty of the disaster. My favorite books make me forget where I am and what time it is, and make me feel like I am there. I wanted this book to be like that, to play out in your mind like a movie. I imagined I was a movie director, and I could only write what I could see through my camera lens. Which camera angles work best for this scene? When are we zooming in on a telling detail? When are we panning out to see the big picture? When do we cut rapidly between scenes to quicken the pace? I decided that in any scene, the reader should only know what the characters knew at that point in time. When you're with the characters in the path of the storm, you can't see the big picture, the whole storm, because they can't. You can only see what they see on TV, or outside their windows, or glean from conversations and texts. Scenes with the meteorologists provide the big picture perspective of the storm as a whole, like a camera panning out. Pacing, too, was very deliberate. Chapters are short, which carries the momentum. But the emotional pacing varies throughout the book. I didn't want to exhaust you with nothing but fear and fast-paced action. There had to be slow, reflective moments as well. Those infuse meaning and also build tension, like stretching an elastic band that will slingshot you through the climactic scenes. I actually thought a lot about the structure and pacing of classical music. The slow chapters also lay out the historical and scientific context of the storm. And gave me a chance to sneak in some science writing, like putting vegetables on my kid's pizza. My hope was that the narrative would pull you through, but you'd learn a lot about tornadoes that might help you make informed decisions if you ever find yourself in the path of one. I want you to care about the characters so deeply that you remember them when the weather turns, and take actions that might save your life. Writing this story was like creating a mosaic. Each fact was like a tile that, when combined with many others, created a bigger picture. There are still many small gaps and unknowns—the grout between the tiles—but that is part of its beauty.